This weekend should have been amazing. Instead it felt like it alternated between On moments and off moments, which I shall recap in the table below. Having lordaerith pick me up on Friday night and going to the Dog & Duck for food, where we randomly ran into a good chunk of the iSchool. It being so packed at the Dog & Duck that we didn't really get to talk to any of them (other than syhira and her boi who sat with us). Going to see the Austin Wind Symphony's tribute to video games. It could have been a lot better than it was. The symphony didn't have a lot of "heart" as lordaeirth put it. Also, they had 2 video screens which would often project images of the game play. I think that in some ways it distracted from the music, because people were more focused on the video. Also, they had a real chance to make it a true interactive-multimedia performance, but only really interacted with the clips from Super Mario Brothers. It was worth the $8 admission. My sister, queencimmy, and her boy, nola_poet, drove into to visit us this weekend. Due to traffic & other factors, they didn't get in until 2:30am. We had figured on them showing up around midnight Friday night. This means I didn't get to bed until almost quarter to 4. On Saturday morning I thought I might have yet another UTI (ooohhh…too much information, right? ), but I don't. Still, it didn't make the morning fun. I got to show queencimmy and nola_poet around UT. We went to the HRC where we surprised nola_poet with an exhibit of the first 40 feet of the original "On the Road" scroll (it's on display until mid-June, I think). After the HRC, I took them to see my second home (aka the iSchool IT Lab). We chilled there for a little bit, walked around a bit more, and then lordaerith and I got yummy yummy food at the Flying Falafel. I had to return a book to the library and pick up on that had come in. Unfortunately, by the time we got to the library it had closed, so I was only able to do the returning. We said good-bye nola_poet and queencimmy for a little while and got to the Texas Union at 5:30 to be first in line for the Jonathan Coulton show (it started at 9). We were the first people in line by a couple of minutes. apryl_knight, cjovalle, qyandri, gruff, iskanderia, and lawtalkyguy eventually joined us on line. While waiting in line, we whipped out Munchkin Cthulhu and I ended up playing a lively game of it with the people who were in line behind us. We never got to finish the game, because the doors opened up before it was over. At least I wasn't the lowest level at that point. At one point while waiting, Jonathan Coulton poked his head out to start setting up his merchanidce. lordaerith asked him if it was okay if we taped him and he said yes as long as it was okay with the venue. I asked him to play "Better" which is one of my favorite songs of his, and he said he would try to. We ended up with two tables right in front of the stage. We were trying to save seats behind us for spottedvasa and bouncyone, but eventually the place was so packed that we had to give them up. After we did that, spottedvasa showed up, but she left because at that point it was standing room only. Next time guys, I promise. The show was AMAZING (as always). There's too much to write up here, so see below for a longer write-up. I will say that he did infact play "Better". Jonathan Coulton's guitar. It sounded fine to me, but he kept tuning it throughout the night and never seemed quite happy with it. We got to tape the show. We didn't tape the funniest part because we were running out of battery power and tape. lordaerith will never hear the end of it. Also, I didn't grab a DV to Firewire cord when I picked up the Camcorder. Now I can't get the concert off of the tape and onto YouTube. I'm going to have to go to campus to get the cord. noeticist's party was still happening by the time we got out of the show. It was pretty much winding down by the time we go there. But we were able to say hi to a few people, especially last_bastion and raenshadoe, who were in from out of town. My sister got all dressed up to go to the party. She didn't end up making it because by the time she was about to leave, the party was almost over. Also, nola_poet's GPS couldn't find the place. We got up really really late (1pm) on Sunday and therefore weren't able to go to brunch at Kerby Lane. We did got to lawtalkyguy's for Super Smash Bros/Rock Band. Queencimmy finally got to meet a good chunk of my friends. We were only there for a little while. queencimmy and nola_poet had to go home. I felt…off/close to tears for the rest of the night. No idea why. Bleh. I discovered that I deleted my "New Pics" folder from my desktop and empty the Trash before I noticed this. This is the folder in which I kept all the pictures from the camera that I have yet to edit & place online. There's a 94% chance that lordaerith has all of the files on his computer as well. He probably has at least 90% of them. I took the whole weekend off to spend time with my sister and do fun things. I already feel like I'm behind on the amount of stuff I have to do over Spring Break. The show was awesome (as I said above). The opening act, Samantha Murphy, was interesting. I like that she played barefoot and was funny enough to keep the audience entertained. Also girl could hold a note. Jonathan Coulton ended up playing 2 sets because there were so many people who wnated to get in and the show was sold out. I think it had to do with some standing-room-only people leaving so others could see the second set. I'm sure I could say tons about the whole show all the songs he played, but hopefully I'll have most of the show up on YouTube soon so you can see for yourself. Therefore, I'm just going to give you the highlights (as I see them). In the first set he played "Better" which had me grinning like crazy the entire time. At the end of "Creepy Doll", lordaerith and I held up our iPhones which were displaying lighters on them. JoCo saw us and totally cracked a smile. I made sure to turn the phone around so the rest of the audience could see it. Since he liked it so much, during "Mandelbrot Set" I ducked my iPhone under the table and used Google Images to find a picture of a fractal, which I then waved back and forth. This definitely made JoCo grin when he saw it. Unfortunately as this was part way through the second set, we were picking and choosing which songs to record because we were running out of tape/batter power (If we had known it would have been a double set concert, we would have brought a second tape!). Therefore, lordaerith decided not to record Chiron Beta Prime because "It's a Christmas song and it's not Christmas time." Also because I don't think he likes it very much, even though I do. Therefore, unless someone else was taping the concert (or just that moment) it will not be up on YouTube. Much sadness. 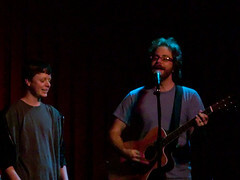 Jonathan Coulton and Me, after the show.